Learn how to customize military rings online and then create your own perfect ring. 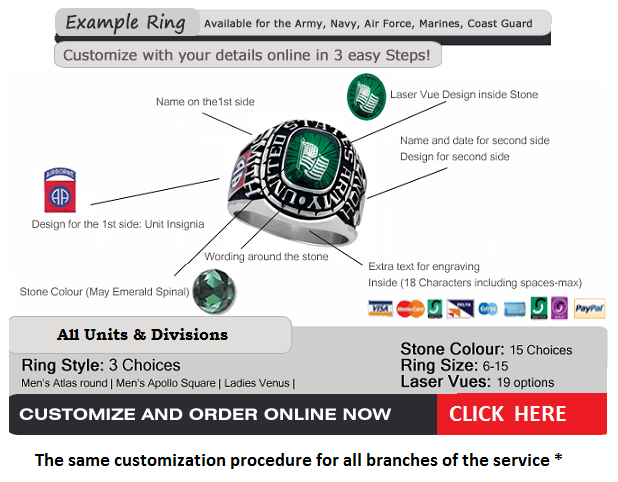 It’s very important to get the customization right when ordering a custom military ring. It’s basically the same for all rings, whether it’s for the Army, Navy, Air Force. Any commemorative military ring should be able to relate a story about your service career. Referring to name, rank, unit or divisions you served with and in some cases important dates. There are nine areas of custom military rings that can be customized. In this informative article we shall outline the areas you should be aware of, to produce and design the perfect ring for yourself or a loved one. We shall start from the top of the ring. The top of custom military rings where we set the stone is probably the most eye-catching area and where the eye is drawn to initially. The sixteen options for stone color predominately relate to the months of the year and birthstones. There are four extra colors, namely Black Onyx, Tangerine, Green Tourmaline and Fireblue Spinel. These have become very popular outside of the twelve main colors. The stone can contain a design which is referred to as a laser vue design and the most popular designs are the branch insignia’s. This is the area around the stone, also on the top of the ring and is referred to as the wording around the stone. The text can read to indicate the branch of the armed forces you serve with. Example: US Army, United States Navy, Air Force, United States Marine Corps and Coast Guard. Military Rings are available for every branch of the United States Military. This is the left shank of the military ring, where you will select a design from the dropdown menu that relates to your unit or division. Example: 1st Cavalry Division, 4th Infantry Division and so on. There are hundreds of options to choose from. This is the right shank of the military ring, where you will select a design from the dropdown menu that relates to your unit or division. Example: Military Police, 82nd Airborne Division and so on. There are hundreds of options to choose from. This is the area above the designs you have select for the side shanks of the ring and is known as the text area of the ring. You can opt for either one or two lines here, but there are restrictions in terms of the amount of characters you can use, because of space available. Limitation: 9 characters per line including spaces, and maximum of two lines. If you wanted to have SFC GREEN who served in Iraq during Operation Iraqi Freedom from 2007 to 2008, this is how you would enter it in the text area of the designer. This is the area inside the band of the military rings, where you can add an inscription or personal sentiment. Example: I love you, My hero and love, Love you Dad. You can use up to 18 characters including spaces in this inscription area. If you follow the above instructions when designing your ring, you will have created the perfect ring. When sizing your ring, inform the jeweller that he should size you for a wide band ring, this will be normally a half size larger than a wedding band.